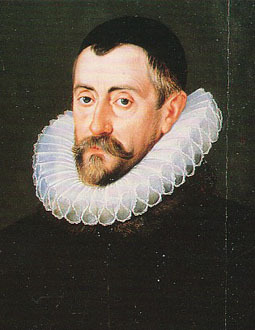 English statesman, the only son of William Walsingham, common sergeant of London, by his wife Joyce, daughter of Sir Edmund Denny of Cheshunt. The family is assumed to have sprung from Walsingham in Norfolk, but the earliest authentic traces of it are found in London in the first half of the 15th century; and it was one of the numerous families which, having accumulated wealth in the city, planted themselves out as landed gentry and provided the Tudor monarchy with its justices of the peace and main support. To this connection may also be attributed much of the influence which London exerted over English policy in the 16th century. Sir Francis's great great great grandfather, Alan, was a cordwainer of Gracechurch Street; Alan's son Thomas, a vintner, purchased Scadbury in Chislehurst, and Thomas's great-grandson William bought Foot's Cray, where Francis may have been born. His uncle Sir Edmund was lieutenant of the Tower, and his mother was related to Sir Anthony Denny, a member of Henry VIII's privy council who attended him on his deathbed. Francis matriculated as a fellow-commoner of King's College, Cambridge, of which Sir John Cheke was provost, in November 1548; and he continued studying there amid strongly Protestant influences until Michaelmas 1550, when he appears, after the fashion of the time, to have gone abroad to complete his education. Returning in 1552 he was admitted at Gray's Inn on January 28, 1553, but Edward VI's death six months later induced him to resume his foreign travels. In 1555-56 he was at Padua, where he was admitted a "consilarius" in the faculty of laws. Returning to England after Elizabeth's accession he was elected M.P. for Banbury to her first parliament, which sat from January to May 1559. He married in January 1562 Anne, daughter of George Barnes, Lord Mayor of London and widow of Alexander Carleill, whose son-in-law Christopher Hoddesdon was closely associated with maritime and commercial enterprise. He was elected to represent Lyme Regis in Elizabeth's second parliament of 1563 as well as for Banbury, and preferred to sit for the former borough. He may have owed his election to William Cecil's influence, for to Cecil he subsequently attributed his rise to power; but his brother-in-law Sir Walter Mildmay was well known at court and in 1566 became chancellor of the exchequer. In that year Walsingham married a second time, his first wife having died in 1564; his second was also a widow, Ursula, daughter of Henry St. Barbe and widow of Sir Richard Worsley of Appuldurcombe, captain of the Isle of Wight. Her sister Edith married Robert Beale, afterwards the chief of Walsingham's henchmen. By his second wife Walsingham had a daughter who married firstly Sir Philip Sidney, secondly Robert Devereux, second earl of Essex, and thirdly Richard de Burgh, earl of Clanricarde. Walsingham's earliest extant communications with the government date from 1567; and in that and the following two years he was supplying Cecil with information about the movements of foreign spies in London. The Spanish ambassador in Paris declared in 1570 that he had been for two years engaged in collecting contributions from English churches for the assistance of the (broken link, topic::huguenot|Huguenots) in France; and he drew up a memorial depicting the dangers of Mary Stuart's presence in England and of the project for her marriage with Norfolk. Ridolfi, the conspirator, was committed to his custody in October 1569, and seems to have deluded Walsingham as to his intentions; but there is inadequate evidence for the statement that Walsingham was already organizing the secret police of London. In the summer of 1570 he was, in spite of his protestations, designated to succeed Norris as ambassador at Paris. La Mothe F�nelon, the French ambassador in England, wrote that he was thought a very able man, devoted to the new religion, and very much in Cecil's secrets. Cecil had in 1569 triumphed over the conservative and aristocratic party in the council; and Walsingham was the ablest of the new men whom he brought to the front to give play to the new forces which were to carve out England's career. An essential element in the new policy was the substitution of an alliance with France for the old Burgundian friendship. The affair of San Juan de Ulua and the seizure of the Spanish treasure ships in 1568 had been omens of the inevitable conflict with Spain; Ridolfi's plot and Philip II's approaches to Mary Stuart indicated the lines upon which the struggle would be fought; and it was Walsingham's business to reconcile the Huguenots with the French government, and upon this reconciliation to base an Anglo-French alliance which might lead to a grand attack on Spain, to the liberation of the Netherlands, to the destruction of Spain's monopoly in the New World, and to making Protestantism the dominant force in Europe. Walsingham threw himself heart and soul into the movement. He was the anxious fanatic of Elizabeth's advisers; he lacked the patience of Burghley and the cynical coolness of Elizabeth. His devotion to Protestantism made him feverishly alive to the perils which threatened the Reformation; and he took an alarmist view of every situation. Ever dreading a blow, he was always eager to strike the first; and alive to the perils of peace, he was blind to the dangers of war. He supplied the momentum which was necessary to counteract the caution of Burghley and Elizabeth; but it was probably fortunate that his headstrong counsels were generally overruled by the circumspection of his sovereign. He would have plunged England into war with Spain in 1572, when the risks would have been infinitely greater than in 1588, and when the Huguenot influence over the French government, on which he relied for support, would probably have broken in his hands. His clear-cut, strenuous policy of open hostilities has always had its admirers; but it is difficult to see how England could have secured from it more than she actually did from Elizabeth's more Fabian tactics. War, declared before England had gained the naval experience and wealth of the next fifteen years, and before Spain had been weakened by the struggle in the Netherlands and the depredations of the sea-rovers, would have been a desperate expedient; and the ideas that any action on Elizabeth's part could have made France Huguenot, or prevented the disruption of the Netherlands, may be dismissed as the idle dreams of Protestant enthusiasts. Walsingham, however, was an accomplished diplomat, and he reserved these truculent opinions for the ears of his own government, incurring frequent rebukes from Elizabeth. In his professional capacity, his attitude was correct enough; and, indeed, his anxiety for the French alliance and for the marriage between Elizabeth and Anjou led him to suggest concessions to Anjou's Catholic susceptibilities which came strangely from so staunch a Puritan. Elizabeth did not mean to marry, and although a defensive alliance was concluded between England and France in April 1572, the French government perceived that public opinion in France would not tolerate an open breach with Spain in Protestant interests. Coligny's success in captivating the mind of Charles IX infuriated Catherine de Medici, and the prospect of France being dragged at the heels of the Huguenots infuriated the Catholics. The result was Catherine's attempt on Coligny's life and then the massacre of St. Bartholomew, which placed Walsingham's person in jeopardy and ruined for the time all hopes of the realization of his policy of active French and English cooperation. He was recalled in April 1573, but the queen recognized that the failure had been due to no fault of his, and eight months later he was admitted to the privy council and made joint secretary of state with Sir Thomas Smith. He held this office jointly or solely until his death; in 1577 when Smith died, Dr. Thomas Wilson was associated with Walsingham; after Wilson's death in 1581 Walsingham was sole secretary until July 1586, when Davison began his brief and ill-fated seven months' tenure of the office. After Davison's disgrace in February 1587 Walsingham remained sole secretary, though Wolley assisted him as Latin secretary from 1588 to 1590. He was also returned to parliament at a by-election in 1576 as knight of the shire for Surrey in succession to Charles Howard, who had become Lord Howard of Effingham, and he was re-elected for Surrey in 1584, 1586 and 1588. He was knighted on December 1, 1577, and made chancellor of the order of the Garter on April 22, 1578. As secretary, Walsingham could pursue no independent policy; he was rather in the position of permanent under-secretary of the combined home and foreign departments, and he had to work under the direction of the council, and particularly of Burghley and the queen. He continued to urge the necessity of more vigorous intervention on behalf of the Protestants abroad, though now his clients were the Dutch rather than the Huguenots. In June 1578 he was sent with Lord Cobham to the Netherlands, mainly to glean reliable information on the complicated situation. He had interviews with the prince of Orange, with Casimir who was there in the interests of Protestant Germany, with Anjou who came in his own interests or in those of France, and with Don John of Austria, who nominally governed the country in Philip's name; the story that he instigated a plot to kidnap or murder Don John is without foundation. His letters betray discontent with Elizabeth's reluctance to assist the States; he could not understand her antipathy to rebellious subjects, and he returned in October, having accomplished little. In August 1581 he was sent on a second and briefer mission to Paris. Its object was to secure a solid Anglo-French alliance against Spain without the condition upon which Henri III insisted, namely a marriage between Elizabeth and Anjou. The French government would not yield, and Walsingham came back, to be followed by Anjou who sought in personal interviews to overcome Elizabeth's objections to matrimony. He, too, was unsuccessful; and a few months later he was dismissed with some English money and ostensible assurances of support. But secretly Elizabeth countermined his plans; unlike Walsingham, she would sooner have seen Philip remain master of the Netherlands than see them fall into the hands of France. His final embassy was to the court of James VI in 1583, and here his vehement and suspicious Protestantism led him astray and provoked him into counterworking the designs of his own government. He was convinced that James was as hostile to Elizabeth as Mary herself, and failed to perceive that he was as inimical to popery as he was to presbyterianism. Elizabeth and Burghley were inclined to try an alliance with the Scottish king, and the event justified their policy, which Walsingham did his best to frustrate, although deserted on this occasion by his chief regular supporter, Leicester. For the rest of his life Walsingham was mainly occupied in detecting and frustrating the various plots formed against Elizabeth's life; and herein he achieved a success denied him in his foreign policy. He raised the English system of secret intelligence to a high degree of efficiency. At one time he is said to have had in his pay fifty-three agents at foreign courts, besides eighteen persons whose functions were even more obscure. Some of them were double spies, sold to both parties, whose real sentiments are still conjectural; but Walsingham was more successful in seducing Catholic spies than his antagonists were in seducing Protestant spies, and most of his information came from Catholics who betrayed one another. In his office in London men were trained in the arts of deciphering correspondence, feigning handwriting, and of breaking and repairing seals in such a way as to avoid detection. His spies were naturally doubtful characters, because the profession does not attract honest men; morality of methods can no more be expected from counterplotters than from plotters; and the prevalence of political or religious assassination made counterplot a necessity in the interests of the state. The most famous of the plots frustrated by Walsingham was Anthony Babington's, which he detected in 1586. Of the guilt of the main conspirators there is no doubt, but the complicity of Mary Stuart has been hotly disputed. Walsingham had long been convinced, like parliament and the majority of Englishmen, of the necessity of removing Mary; but it was only the discovery of Babington's plot that enabled him to bring pressure enough to bear upon Elizabeth to ensure Mary's execution. This circumstance has naturally led to the theory that he concocted, if not the plot, at least the proofs of Mary's connivance. Undoubtedly he facilitated her self-incrimination, but of her active encouragement of the plot there can be little doubt after the publication of her letters to Mendoza, in which she excuses her complicity on the plea that no other means were left to secure her liberation. Considering the part he played in this transaction, Walsingham was fortunate to escape the fate which the queen with calculated indignation inflicted upon Davison. Waisingham died deeply in debt on April 6, 1590. Since 1579 he had lived mainly at Barn Elms, Barnes, maintaining an adequate establishment; but his salary did not cover his expenses, he was burdened with his son-in-law Sir Philip Sidney's debts, and he obtained few of those perquisites which Elizabeth lavished on her favorites. He had little of the courtier about him; his sombre temperament and directness of speech irritated the queen, and it says something for both of them that he retained her confidence and his office until the end of his life.